Two years ago, we published a report on what came to be known as the “left-to-die” boat case. Two years ago, we published a report on what came to be known as the “left-to-die” boat case. Co-authored with the architectural office SITU Studio, the report used imaging, mapping, and modelling technologies in order to produce a visual and spatial picture of how, in March 2011, sixty-three migrants lost their lives in the Central Mediterranean while attempting to reach the small Italian island of Lampedusa from the coast of Libya. The passengers of the “left-to-die” boat were amongst the over 27,000 people who fled Libya towards European shores (over 1,000,000 people fled to neighbouring countries in North Africa) after the beginning of the uprising against Gaddafi and the following international military intervention. These crossings occurred in particularly precarious conditions – with the Gaddafi regime playing an active role in forcing migrants onto boats without regard for even the minimal safety measures. As a result, over 1.500 deaths were recorded among them, one of the all-time highs. These deaths however occurred at a time when the militarization and surveillance of the EU’s maritime frontier was at its apex. The usual assets of national border police from both sides of the Mediterranean, were reinforced by over forty military ships and many patrol aircrafts deployed by western states off the Libyan coast in support of the NATO-led international military intervention. This placed these deaths squarely in the most highly surveyed waters in the entire world, and there were strong indications that military forces were failing in their obligation to rescue migrants in distress, despite possessing the requisite means of surveillance to witness their plight. The initial testimonies of the nine survivors of the “left-to-die” boat case provided a devastating indictment of this deadly inaction: they claimed that they were left to drift for 14 days in the area monitored by NATO, despite sending a distress call as well as encountering at least one military helicopter and a military ship. With the aim of identifying direct responsibility for these deaths, a loosely associated network of journalists, NGOs and institutions such as the Council of Europe launched parallel investigations on the case. In support of this endeavour, our report corroborated the survivors testimonies with a wide range of digital mapping and remote sensing technologies – from drift modelling to determine the trajectory of the drifting migrants’ boat to satellite radar imagery to detect military vessels in proximity. As narrated in the video animation that we release today, by using surveillance technologies against the grain, we were able to read the traces left on the surface of the sea. Turning the ocean itself into a witness for interrogation, we reconstructed and mapped as accurately as possible what happened to this vessel. While none of the parallel investigations on this case was able to determine the identity of the helicopter and vessels that entered into direct contact with the migrants in distress, they all concurred that the account of the survivors was highly accurate. In our report, we established with certainty that the Italian and Maltese Maritime Rescue Coordination Centres, as well as NATO command, were informed of the location and distress of the migrants, and that there were several naval assets in the vicinity of the boat that had the ability to detect and assist it, but that none of these actors intervened in a way that could have averted the 63 deaths. The collective failure to assist the passengers amounted to murdering them without touching their bodies, turning the winds and currents into a deadly weapon. On the basis of our report and the other investigations, a coalition of NGOs has filed legal cases against several of the states participating in the military operations in Libya, including Italy, France, Spain and Belgium, and submitted Freedom of Information requests in Canada, the US, and the UK. The Dutch Senator Tineke Strik also sent, on behalf of the Council of Europe, official demands to all actors involved to ask for further details about their (in)actions. In the process, no element either of our or the other reconstructions has been disproved. No public statement, no journalistic investigation, no legal inquiry has even tried to challenge the facts as we have reconstructed them. On the contrary, a French judge reviewing the case lauded the, “exhaustive investigations by prestigious international bodies”, before using the rigour of our inquiry to justify her refusal to investigate the case any further, claiming, on the unique basis of the (non)answer by the French military (i.e., the accused), that French assets were not deployed in the area. In tortuous diplomatic non-answers (of which the correspondence contained in Strik’s follow up report provides a striking example), NATO and participating states have failed to provide exhaustive answers to simple questions such as the location of their assets during the time of the events (which are certainly meticulously recorded in their assets’ log books) or justify their (non) response to the distress call. Neither have they sought to disprove the allegation of the survivors that they were visited twice by a military helicopter and encountered a large military ship. It is as if the huge military surveillance apparatus that refused to see and react to the slow death of the 63 passengers over a period of 15 days had now itself become invisible to public scrutiny. While fully visible to the public, the collective crime of which the passengers have been the victims has remained invisible to the law. In the production of report, satellite imagery was crucial in confirming the presence of a high number of ships in close proximity of the drifting migrants’ boat. 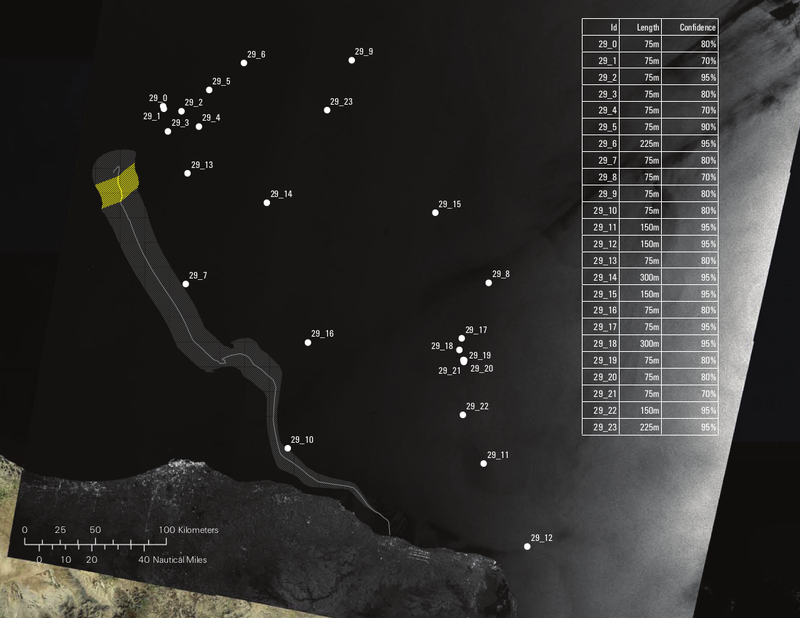 Pictured here Envisat-1 Synthetic Aperture Radar (SAR) satellite image for 29 March 2011 with corresponding table of returns documenting estimated length of vessel and confidence. Analysis by Lawrence Fox III, Humboldt State University Emeritus Professor of Remote Sensing, for the Forensic Oceanography report. See larger version. As a result of the lack of response and legal inquiry, not a single actor has been made responsible for the deaths of the 63 passengers. The indifference which led to their being abandoned to the winds and currents, continues to plague the demand for justice of the survivors, perpetuating their drift even on firm land. Such a continued impunity sends out the message to all actors operating at sea that migrants can be abandoned to their deaths with no consequence. And in effect, similar incidents have repeated this since. Deaths at the Borders of Europe. Source: Migreurop, Atlas of Migration in Europe: A Critical Geography of Migration Policies (London: New Interna- tionalist Publications, 2013). See larger version. In her June 2014 follow-up report, Strik notes importantly that several recent incidents – including two of them that occurred near Lampedusa on October 3 and 11, causing the death of more than 550 people - demonstrate not only that justice has not been dellivered to the survivors of the left-to-die boat case, but that no lessons have been learned from it. The October 11, 2013 shipwreck, which we have jointly documented with the WatchTheMed network, effectively seems in many ways the tragic repetition of the left-to-die case: a boat carrying more than 400 people started taking in water after it was shot by a Libyan vessel. Despite the Italian and Maltese coast guard being warned of the imminent distress of the passengers, rescue was delayed for over 5 hours and patrol vessels arrived only 1h after the boat had sunk and more than 200 people had died. If this is the last case of migrants’ death being caused by the failure to assist them when in distress, several other incidents related to different causes have continued to prolong the list of close to 15.000 documented deaths at the EU’s maritime borders over the last 20 years. As the very periodiziation of these deaths makes evident – the count starts at the end of the 80s, when visa restrictions were imposed by EU states towards the non-Europeans and the first bodies of migrants washed away on European shores – these are less “tragedies” than deaths by policy, produced by the combined mechanisms of illegalisation, militarisation and refusal to assist. The initial denial of visas to access the EU’s territory produces ripple effects throughout global space, with bordering practices enforced by or on behalf of the EU extending ever further within and without EU territory, thereby precaritizing non-European migrants’ entire trajectory. As they arrive on the southern Mediterranean shore, they are forced to resort to dangerous means of crossing and rely on smuggling networks, which usually provide boats in poor condition, overload them to maximize their profit, and offer only minimal - if any - security measures. While one should not deny the responsibility of smugglers and authorities that allow them to operate - without the EU’s policy of illegalisation, migrants would not resort to them. Secondly, in order to detect and intercept illegalized migrants, border patrols and surveillance means were deployed by EU member states. Frontex (the European border agency), as well as states located on the southern shore of the Mediterranean were put under pressure by the EU, thus effectively turning the Mediterranean into a vast frontier zone. This militarization on the one hand leads to repeated acts of direct physical violence by border guards – such as shootings, collisions, and punctured boats, but also push-backs - which are not only illegal according to international law but may involve the use of violence as has recently been the case in Greece recently. But the most deadly effect of militarisation is less direct. In the attempt to evade border guards and avoid being intercepted, deported and violated, migrants use longer and more perilous routes, which cost more lives. Over the last 20 years, the militarisation of the EU’s maritime frontier has thus not succeeded in stopping illegalised crossings, but has caused the splintering of trajectories to more dangerous routes. Finally, as a consequence of the very precarious condition that migrants are forced to resort to, they regularly encounter situations of distress – with failing motors, water entering the boat or loss of direction - and call on the rescue agencies operating in the area or the many vessels transiting in the Mediterranean for help. Nevertheless, because rescuing migrants at sea entails taking responsibility for the processing of the asylum requests or for their deportation, coastal states have grown increasingly reluctant to assist migrants in distress. While international conventions on the Laws of the Sea have sought to ensure the responsibility to rescue passengers in distress regardless of nationality or status, coastal states use overlapping Search and Rescue areas, conflicting conventions and differing interpretation of international law to evade their responsibility. Furthermore, the criminalisation of assistance by states – fisherman for example have been put on trial for “assisting clandestine migration” after rescuing migrants – has also been a disincentive for seafarers to comply with their obligation to provide assistance. Here too then, while one should in no way diminish the responsibility of specific actors for practices of non-assistance – fishermen, commercial ships, or, as we have seen in the left-to-die boat case, the military and coast guard itself - it is clear that their behaviour is framed by the EU’s migration policy of generalised reluctance to accept non-European migrants and refugees on its territory. As such, cases of non-assistance are not “accidents” or simply the product of malevolent actors, but rather occur on a structural basis. Governed by a partial and deterritorialised sovereignty regime which enables EU states and agencies to selectively expand their elastic bordering practices or retract from their responsibility to assist passengers in distress, the Mediterranean Sea has thus become a space of deeply hierarchised and segmented mobility: speedy and secure for certain goods and privileged passengers, slow and deadly for the unwanted. This regime produces deaths on a large scale far from any civilian gaze. This loss of life remains largely unaccounted for and – with most bodies remaining unidentified in their liquid grave – unmournable. The public outcry that followed the death of more than 550 people in two successive shipwrecks in early October 2013 seemed, for a fleeting moment, to indicate that suddenly a realisation of the deadly effects of the EU’s migration policy was emerging, and that a window of opportunity to rethink another policy had been opened at the cost of these lives. However, instead of questioning the very migration policies which had produced those and the previous deaths, the EU took what it called a “tragedy” as an opportunity to increase surveillance and militarisation, albeit under a humanitarian varnish: North African states were urged once again to prevent migrants from leaving their shores; Frontex, the European border agency, was called upon to extend its operations to the whole Mediterranean and received extra funding to this effect; a new surveillance tool which had long been in development - Eurosur, the European Border Surveillance System – was launched with the claim that it would help prevent deaths; finally, a large scale operation – Mare Nostrum – , defined by the Italian Ministry of Defence as a “humanitarian operation, […] as well as a security one”, was launched by the Italian government. However, the claims of these “new” initiatives to save lives are dubious at best and rather show how humanitarian arguments have themselves been enlisted within the same logic of closure and militarisation that, as we have argued, is the root cause of death and violence at the border. The claim of the proponents of Eurosur that while current surveillance technologies have difficulty detecting small boats used by migrants, Eurosur will be able to do so through cutting-edge remote sensing technologies – such as drones, radars, and satellites – does not withstand the test. On the one hand, the cases of the left-to-die boat and of the 11 October 2013 blatantly demonstrate that it is not enough to detect boats in distress to save lives. On the contrary, migrants are regularly abandoned in all knowledge of their fate. Furthermore, although Eurosur was launched in December 2013, concurring with many critical assessments including our own, Frontex has recently admitted that Eurosur does not have the capacity to date to detect migrants’ numerous small boats in such as vast maritime area. As for the operation Mare Nostrum, it has not been able to put an end to deaths at sea, despite the deployment of 6 Navy ships as well as several aerial assets, including unmanned drones. 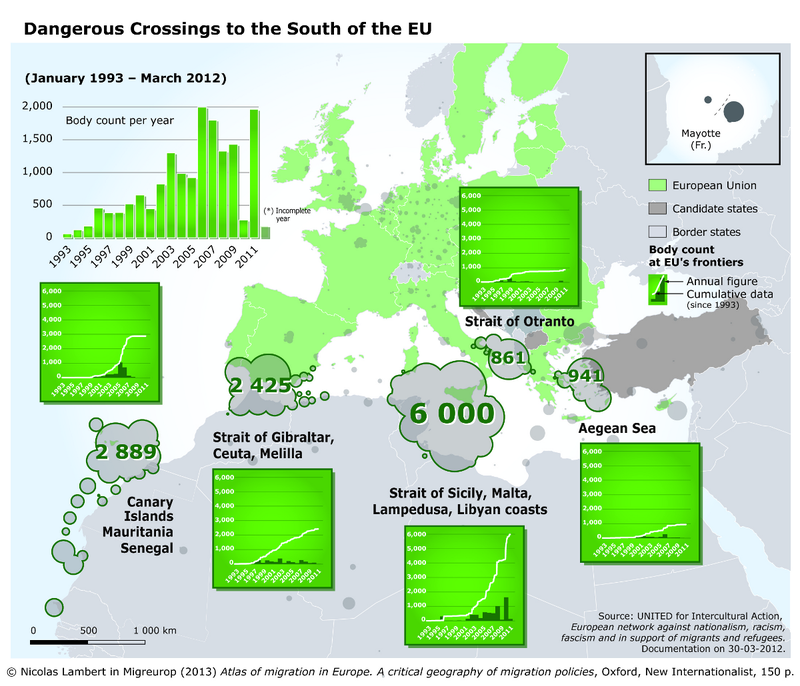 Since the start of the operation, the number of crossings have intensified. While over 50.000 people have been saved since the beginning of the year, (among which are many Syrians families fleeing the civil war) several shipwrecks happened in the last weeks costing the lives of tens of people have shown once again that no surveillance apparatus will ever be able to avoid these deaths. Instead, what Mare Nostrum has achieved, has been to transform rescue at sea into border enforcement operations that expedite deportation of certain migrants, while slowing down the mobility of others who are stranded in the camps of southern Italy with no further assistance. As such, we see that the new operational measures implemented by the EU in the aftermath of the October 2013 “tragedies” are far from offering an alternative the continuing deaths of migrants at sea, and rather represent a continuation of the very practices that have caused them in the first place. On the policy level, the response so far leaves little more hope. A “Mediterranean Task Force” was created by the EU Commission, which made a number of proposals to the December 2013 EU Council meeting. These were already mostly geared towards strengthening border controls, but the little humanitarian provisions they contained – such as increasing resettlement of refugees and opening further possibilities for asylum applications to EU member states from outside the EU - were thrown out by the Council in December and would in any case have been insufficient to put an end to the death of migrants at sea. Neither further strengthening border controls, nor even the desirable guarantee of further compliance with human rights will bring the death of migrants to an end, for these deaths have, as their root cause, the denial of legal access to non-European migrants. Short of lifting this ban, these deaths will continue. In the month prior to the EU Council’s meeting of the 26-27 June which will address long term European migration policy groups of activists have been performing collective acts of transgression of the EU borders. A transnational Refugee March, composed to a large extent by asylum seekers, refugees and undocumented migrants has been travelling from Strasbourg to Brussels, ignoring the restrictions on movements imposed on them, to demand an end to the policies of border closure. It has been joined by caravans of migrants and activists from Italy who, on board of a no border train have been following the routes that migrants rescued in the Mediterranean are usually forced to take in hiding on their way to other European countries. European nationals, migrants, refugees have challenged together the rhetoric of Europe as a space of “free circulation” and questioned their very division into different categories of people, some of which can move, some who cannot. They demand not only freedom but also equality of movement. In performing collectively and publicly the transgression of the EU’s internal borders, they also echo the every-day clandestine crossings of all the other extended external borders of the EU – which, in practice, extend from the Sahara to the Mediterranean, passing by the fences of Ceuta and Melilla. Together, they remind us that human beings are essentially free in their spatial mobility, which persists independently of any attempt to govern them. Despite this daily reality of movement across borders, demands for freedom of movement and the right to a safe, legal access to European territory have often been portrayed as a distant, unrealistic utopia imagined by a handful of dreamers. But don’t more than 20 years of continued illegalised migration and deaths at the EU’s borders amply demonstrate that what is utterly unrealistic is in fact the banning of non-EU migrants and the attempt to stem their mobility? The reality is that the number of deaths at the borders of Europe has augmented under the effects of militarization and will continue to rise short of anything less than a radical opening of our political imagination towards freedom of movement. The actual movement of migrants point towards such a horizon, as do the collective demands of migrants’ rights organisations recently expressed in the Lampedusa Charter or through the joint call of the Migreurop network. Scholars have also explored what the recognition of a Right to Mobility might entail. Certainly, a first incentive for such a reorientation to take place would be to make EU states and policymakers accountable for their (in)actions and the consequences of their practices that produce deaths on a large scale. Rather than an exceptional event, the story of the “left-to-die” boat narrated in our video is just one of the many examples of deaths by policy. This is why, beyond individual responsibilities, bringing justice to the passengers of the “left-to-die” boat would be a modest but fundamental step towards another Europe.